January 30, 2010  The Palestinian minister of economy tells NPR that in the next few months it will become illegal for Palestinians to work in Israel's West Bank settlements. Palestinians who flout the new rule will be jailed and or fined. It's the next phase of plan currently underway to boycott settlement products. But thousands of Palestinians earn their livelihood in settlements, many of them in construction. January 30, 2010  Protests over Israeli building projects in East Jerusalem, seized by Israeli forces in the 1967 war, have re-energized the Israeli left wing, with hundreds gathering for the largest demonstrations in years. But the weakness of left-wing parties in the current Israeli government has left the protesters vulnerable. With no political backing or support, dozens of activists have been arrested and a number of NGOs threatened. January 29, 2010  The Israeli movie Ajami, short-listed for an Oscar, does not include the well-worn characters that Western audiences have come to expect from Middle Eastern movies. Rather, focusing on a gritty neighborhood in the old seaside city of Jaffa, it delves into the urban problems and personal conflicts of the area's residents. And it pays special attention to an often invisible minority — Israeli Arabs. In 'For My Father,' A Bridge-Building Too Far? January 28, 2010  A Palestinian suicide bomber becomes just another outcast in a shabby Tel Aviv neighborhood in this Israeli fable of cross-cultural empathy. Director Dror Zahavi doesn't go so far as to contrive a happy ending — but he does put an awfully cheerful spin on conflicts that don't usually inspire much optimism. January 27, 2010  Thousands of Iranians continue to rally in support of opposition leader Mir Hussein Moussavi despite an often violent government crackdown. Robert Kagan, a senior associate at the Carnegie Endowment for International Peace, says President Obama has an opportunity to help spark democratic change in Iran, but he must act now. January 25, 2010  Bin Laden's ability to frame an entire tape around a failed bombing attempt demonstrates how badly the American public's over-reaction played into al-Qaeda's hands. January 21, 2010  U.S. envoy George Mitchell is back in the Middle East, trying to revive peace talks between the Israelis and Palestinians. A series of demands from both sides have prevented a resumption of peace talks, and neither side is optimistic about the outcome. January 16, 2010  Despite visits between American, Israeli and Palestinian officials, there’s still no visible movement toward new peace talks. Host Scott Simon interviews Michael Oren, Israel's Ambassador to the United States, about the effort to restart Israeli-Palestinian peace talks, the debate over a settlement building freeze in the West Bank, the Gaza Strip border dispute, and the death last week of an Iranian nuclear scientist. January 12, 2010  The recent attack by a Jordanian suicide bomber on a CIA base in Afghanistan revealed the depth of the cooperation between the two allies. But even though the Jordanian government is pro-Western, anti-American sentiment runs high in the desert kingdom. 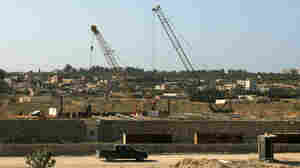 January 11, 2010  Egypt is building a new underground barrier aimed at blocking hundreds of smuggling tunnels under its border with the Gaza Strip. Palestinians fear what the barrier could mean for Gaza, while Egyptians are angry about the new criminal class the tunnels have spawned. January 11, 2010  Over the weekend, a video showing the Jordanian bomber who killed seven CIA employees in Afghanistan was broadcast on Arab and Pakistani television. He appeared dressed in camouflage and vowed to avenge the death of a Taliban leader killed by an unmanned drone. He lived in Amman, and a friend says he was kind and would be the last person you'd think would do something like this. January 10, 2010  There was a massive celebration this week for the 10-year anniversary of Birthright Israel. The nonprofit program, which pays for young Jews to come to Israel to connect with their Jewish roots, is a runaway success. But not everyone thinks that's a good thing. Birthright Unplugged is a program that takes Jewish-American university students to the occupied territories to show them what they say is the reality Birthright Israel ignores in its quest to bring Jews from around the world to Israel. NPR's Lourdes Garcia-Navarro reports. January 9, 2010  With the new year, we're told to expect a new push to restart Israeli-Palestinian peace talks. Those talks stalled last year, but Secretary of State Hillary Clinton sat down this week with Egyptian and Jordanian officials to talk about the U.S. commitment to the process. Among the officials she met with was Egypt's Foreign Minister Ahmed Aboul Gheit. Guest host Mary Louise Kelly speaks with Gheit. January 8, 2010  Secretary of State Hillary Clinton is making a new effort to revive peace talks, and the Obama administration's Mideast envoy will travel to the region soon. 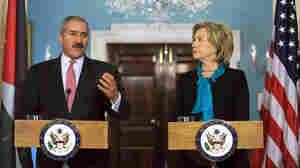 Clinton said Friday there is a sense of urgency to reach an agreement. January 8, 2010  Israel, under constant terrorist threat, hasn't faced a hijacking incident since 1969. But the costs are high. The country spends around 10 times more per passenger than the United States.